The ICC’s new Irish House Restaurant and Trinity Pub includes a handcrafted bar with custom woodwork, bar and table seating, fireplace and snug. 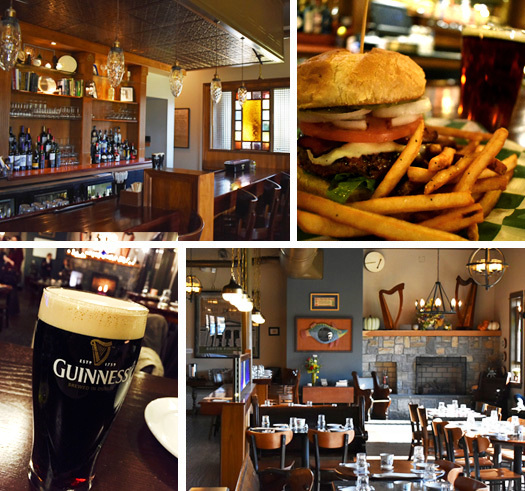 Our chefs have prepared a tempting selection of lighter fare, dinner options, and a full drinks offering, served in the cozy atmosphere of a Dublin pub. The Trinity Pub is named for the trio of volunteers who put in two long years of endless work – Will Carey, Bev Browne and Dan McGrath. The current open house period is designed as an introduction to our new space and a transitional period for the ICC, and is planned until the construction of the facility is completed. Gift certificates are available for the restaurant. Please visit us or call 413-342-4358. The restaurant and pub are available for private events – more information. Located at the Irish Cultural Center, 429 Morgan Road in West Springfield, MA.